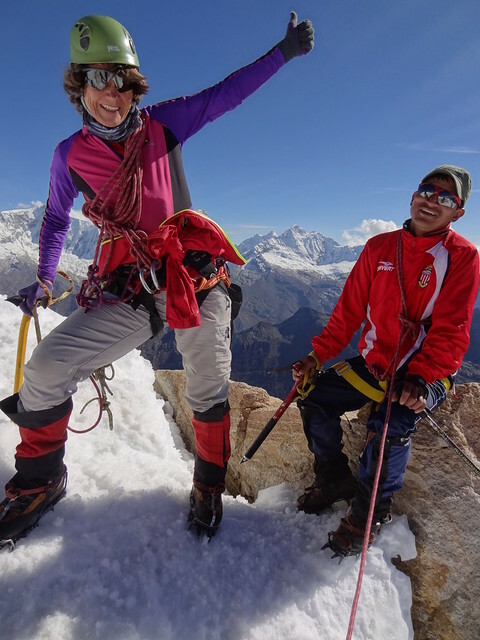 Just in the nick of time – I’m off to Nepal on Friday – I’ve finished Flickering and writing up my notes from last summer’s Cordillera Blanca Traverse with Val Pitkethly. Rendezvoused with Barney (and Tom and Jo) at London City Airport, then all aboard our KLM flights from LCY to Lima via Amsterdam. We were on a brand new plane for the main flight. Once landed in Lima, Alphonso and Lydia met us at the airport and drove us to the familiar Faraona Grand Hotel in Miraflores. The unusually empty streets were due to football – Peru were playing Chile in the Copa América. Dinner courtesy of Metro supermercardo on Calle Schell. 9.30am Cruz del Sur bus from Lima to Huaraz. Alphonso ferried us from the Faraona to the bus station in Lima, and sorted tickets and bag check. Val and Patty met us in Huaraz. Our bags took a taxi and we walked to the Hotel Colomba – where the old dining room is no more, and a new set of rooms is being built. The land to the back is being built on too, but not for the hotel. Dinner at El Rinconcito Minero with Brian & Mia, Jim & Donna – four Canadians who’d just completed the Alpamayo Circuit with Val. Breakfast in the Hotel Colomba’s old gym rooms then out and about in town: coffee and farewells to the Canadians at Café Andino, shopping for postcards and stamps for Barney, shopping with Val for supplies at Daniella’s shop and a mooch around the market. To Melky and Antonia’s, where we were given lunch, then back to the hotel for kit check and digging in the stores for crampons, ice axes, harnesses and helmets. Later in the afternoon Barney and I took a taxi ride with Ebel up to the cross and Mirador at Rataquenua for a beautiful sunset over the Blanca, including crystal clear views of Huascarán‘s summits – Sur (6768 m / 22205 ft) & Norte (6654 m / 21831 ft). Dinner at Bistro de los Andes, a great view out over the Plaza where people were paying a chap to let them look at the full moon through his telescope. 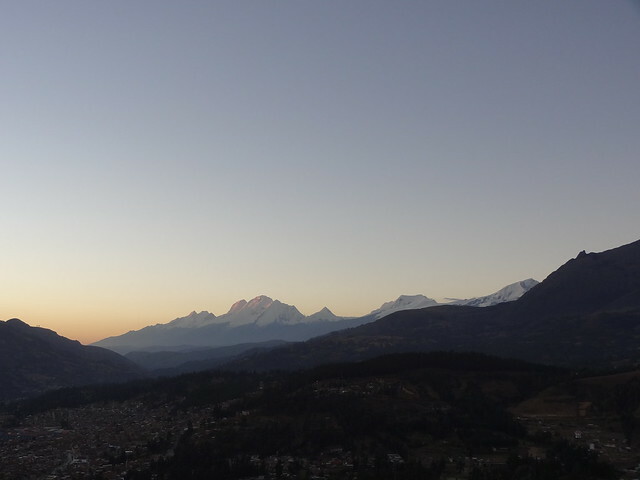 A smashing morning out, doing the Cordillera Negra descent from Shecta back to Huaraz. Clear blue skies, gorgeous views of the Cordillera Blanca on the far side of the Callejón de Huaylas. Crops in the fields and flowers in bloom. Magic. A quick drink at Cafe Andino then back to El Rinconcito Minero for their set lunch followed an afternoon pottering around and packing – daypack for a couple of nights at the Lazy Dog Inn, and main kit bag for the main traverse. Dinner at Creperie Patrick (with the complimentary Pisco Sour). Cash from the BCP. Farewell to Hotel Colomba (for a while at least) and Ebel’s taxi up to The Lazy Dog Inn (3650m) where we settled into the tee pee. Hiked up towards Quebrada Llaca as far as the familiar Parque Nacional Huascarán sign at 3965m. More fierce dog encounters en route. Hot but breezy. Back for lunch and knitted souvenirs at Cafe Yurac Yacu, where we met Viriginie. Getting cloudy and grey overhead, so back to the Lazy Dog to chill out in the lounge with cups of tea, and our first game of scrabble for the trip – on a Spanish board – and, later, the log fire and chatting with other guests. It’s the Independence Day long weekend to those that get US holidays. Good dinner then off to sleep in the tee pee. Comfy but restless. We woke to clear skies and lovely views out across the Callejón de Huaylas to the Cordillera Negra. Big breakfast, packed lunches assembled then off for a hike over and into the Quebrada Achiqua. More “up” than yesterday, and over rougher terrain to get to the valley. Quenual trees lined the path and we lunched looking down onto horses grazing below, with the foothills of the Nevados Wallunraju and Janyaraju above. On through Quenual woods and “just round the corner” (and up!!) following the stream to a combe at 4600m, although we didn’t get to Laguna Ahuac that’s marked on the map (Alpenvereinskarte 0/3b – Cordillera Blanca – Süd). Our return route featured more tussock grass traverses and fierce dogs, pine plantations and prickles. Hot and thirsty work, and tea on our return to The Lazy Dog Inn was very welcome. About half an hour after we’d got back, the clouds that had been gathering all afternoon burst – bringing rain and hail, and a stunning double rainbow. Spent most of the afternoon trying to get rid of a headache – think it was brought on by the heat rather than height. Many cups of coca tea and hot water didn’t work, but a magic green pill from Val did. Dinner and night 2 in the tee pee. Cordillera Blanca Traverse day 1. After another fine breakfast at the Lazy Dog Inn, Claus and the minibus arrived and we drove to Pitec passing Melky and the burros en route. The Portada de Quilcayhuanca, just past Pitec, was our entry point into the Parque Nacional Huascarán (UNESCO World Heritage Site no 333), and after unpacking the minibus we donned daypacks, paid our park fees and set off on foot along the beautiful Quebrada Quilcayhuanca. The skies were clearing and the path along the valley floor made for easy walking. Lots of birds – yellow finches and Andean Flickers and Andean Geese – plus a sick calf on the path (Val suspected it had been tempted by the poisonous berries). A stop for apples, juice and an exploration of the Inca ruins at Nuevo Tambo, with fab views of Nevado Chopíraju at the head of the valley, then onward to the junction of Quebradas Cayesh and Quilcayhuanca, where we planned to camp for the night. Melky, Claus and the donkeys were following, but only after lengthy negotiations over the increased village payment at the gate, so we got to our camp site well ahead of them. Val sent Barney and me off to walk up the conical, terraced hill at the junction of the valleys. It’s another Inca site, albeit with not so many stone remains, with clear views along the valleys and up to the Nevados Cayesh, Chinchey and Pucaranra. Plenty of photo opportunities. Spotting two yellow tents going up in the valley below us, we headed back – taking the easier rock bridge back across the river this time. We’d used a fallen tree first time round. Back at base we sorted out tents – Val and I are in Yerupajá, Barney in El Toro. It had become overcast and with high mountains all around it soon got chilly down in the Quebrada, so our late lunch at 3.30pm segued into tea and Oreos in the dining tent, then dinner. Evening loo trips revealed that our rock-sheltered camp site was also a popular overnight stop for the local horses. Cordillera Blanca Traverse day 2. Frost on the tent first thing heralded clear skies. Bed tea at 7.15am then breakfast of porridge and an omelette bap, with lots more tea. Camp struck, we retraced our route across the river and up towards the Inca lookout hill, leaving Quebrada Quilcayhuanca and continuing up Quebrada Cayesh. Fab views – Nevado Cayesh a snow topped needle at the far end of the valley, and behind us Ranrapalca. On the south side of the valley, high waterfalls. A bushy tailed Viscacha on the rocks. Reaching camp 2, we crossed the river and climbed up the glacial moraine between Chopíraju and Cayesh – to acclimatise and to practice walking up/across scree (still not my strong point, it turns out). A steep ascent over wet scree, cho cho covered slopes and slippery sandy paths, but worth it – we emerged on the moraine wall high above the technicoloured mineral lakes, with stunning views of Cayesh, its snowfield and glacier to the south east and across the Irn Bru orange, mineral-rich river valley below to the vertical rock strata pointing up towards Nevado San Juan to the south west. Back down at the river, Melky and Claus had set up camp, and two climbers were packing for their attempt on Cayesh. Barney, Val and I tucked into a very welcome late lunch followed by some RnR until Virginie arrived c4pm, bringing chocolate brownies – perfect for afternoon tea. 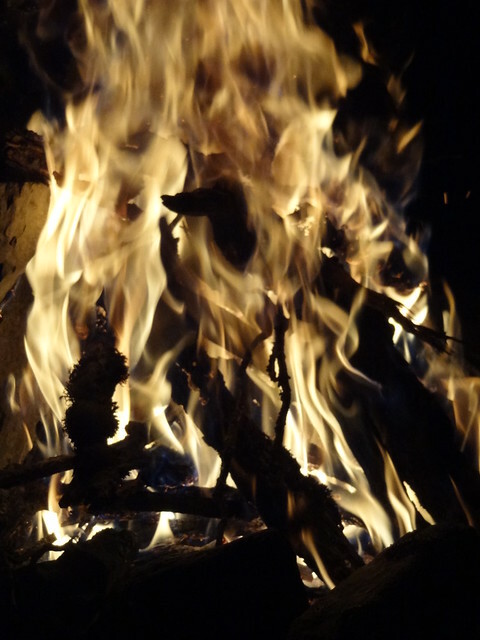 Lots of photos as the afternoon wore on – blue skies and snow looking spectacular – and as night fell we picked out planets, satellites and stars, and gathered wood for a bonfire before dinner and bed. Cordillera Blanca Traverse day 3. Another day of blue skies. Breakfast then up the other side of Quebrada Cayesh for more acclimatisation, this time carrying crampon-kit (crampons, Scarpa boots, harness and helmet). Easier underfoot than yesterday, albeit with some exposed rock sections to climb across. 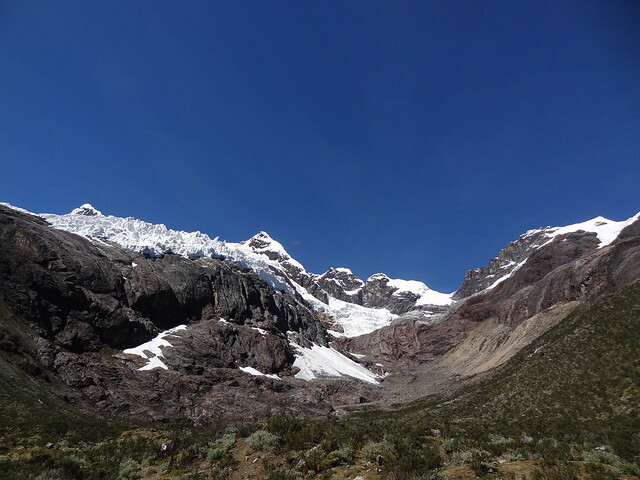 Our path took us up the lower slopes of Nevado San Juan to 5000m, just below the Punta Villon / Maparaju glacier. Magic views back across the valley and over to Nevados Cayesh and Chopíraju and their glaciers, and Ranrapalca to the north west. Beautiful. A steep descent with a final bush-bash back to camp, where we were welcomed by Claus’s dog, Olly – his eye sight clearly not so good! Soup and toasted sarnies for lunch then all the way back down the Quebrada Cayesh, across the river and turning right into Quebrada Quilcayhuanca. 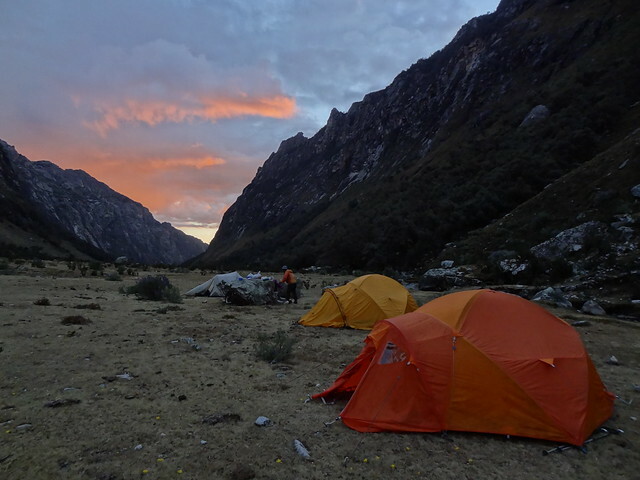 Camp 3 was at Pampa Tullpacocha (4270m), a lovely riverside field edged with boulders and Quenual trees. Fab views up the valley to Tullparaju and the moraine walls of Tullpacocha, Chopíraju to the east and the sun lit slopes of Nevado San Juan to the south east. Cordillera Blanca Traverse day 4. 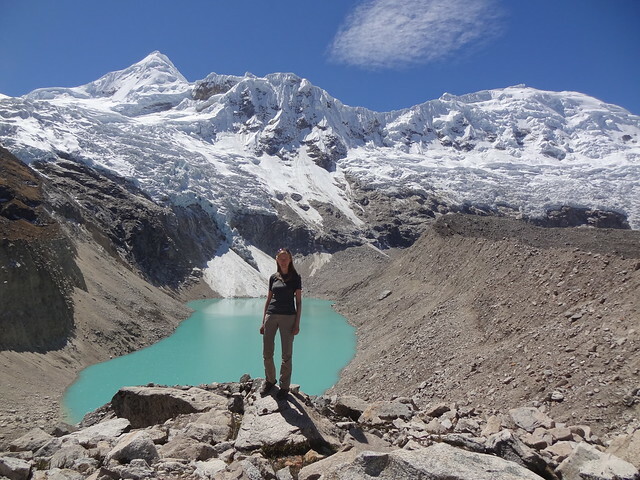 Morning walk up to Laguna Tullpacocha (4395m) – glacial blue with Tullparaju (5787m) backdrop, then back to our Pampa Tullpacocha camp to pack up and head north out of Quebrada Quilcayhuanca. We zigged zagged up out of the valley along an old Inca route to Cuchilla Pampa, saying farewell to Virginie en route and arrived at our Cuchilla Pampa camp which we shared with the local herd of cows. Leaving our daypacks out of reach of cows’ tongues, we strolled up to the second lovely lake of the day – the glacial green Laguna Cuchillacocha (4695m). A lovely lounge against a rock, chatting with Val and taking in the scenery – Nevado Pucaranra (6156m) looming over the lake, sending glaciers down to feed the laguna. By the time we’d got back to camp, Melky, Claus and the donkeys had arrived and it was time for a late lunch. Our Cuchilla Pampa camp was in a beautiful spot – a clear stream flowing nearby (and time to do a little bit of laundry), rolling hills and high plateaus providing superb views back down into the Quebradas we’d come from and up to the Nevados above – an old Inca look out hill nearby. We spent the rest of the afternoon exploring before preparing for our lightweight section of the traverse, and meeting Freddy and Beto who were to be portering for us for the next 3 days. Scarpas, crampons, harness, helmet and ice axe took up almost all of the space in my daypack. 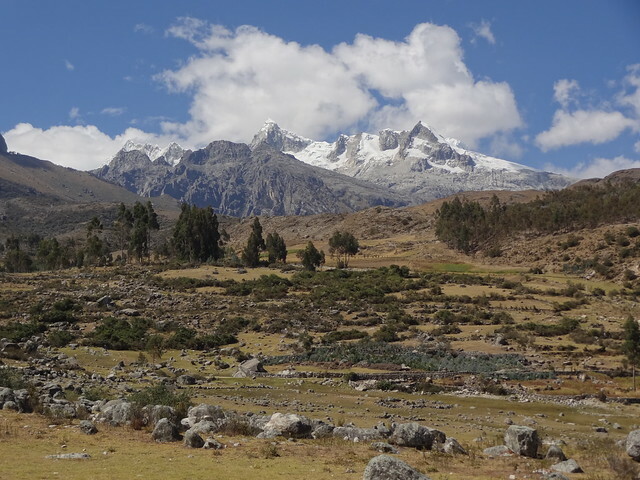 We divvied up the kit that we didn’t need into two more piles – stuff that could go back to Huaraz, stuff that we’d want again once we’d got to Ishinca Base Camp. Like clean underwear…. Packing done, and crazy cattle antics avoided (cows in heat pursued by bulls careered close to our tents) I headed up the nearby Inca hill where horses and cows were grazing. A condor swooped overhead. Calves played. Magic views from East to West: N. Jatunmontepuncu (aka Huapi, 5421m), N. Pucaranra (6156m), N. Chinchey (6309m)(just) and the ridge across to N. Tullparaju (5787m) and another to N. Chopíraju (5518m) with its multicoloured lower slopes and then round to N. San Juan (5843m) to our South, now missing a large chunk of snow/glacier that forms the main ascent route – the loud boom we’d heard this morning had been that avalanching off. As the early evening light faded, Barney and I headed back to camp via a small pond, which provided beautiful reflections of Pucaranra. A bonfire to roast a chicken or two, dinner (pollo y papas fritas) and then bed. Cordillera Blanca Traverse day 5. A slow start, getting all the kit allocated. 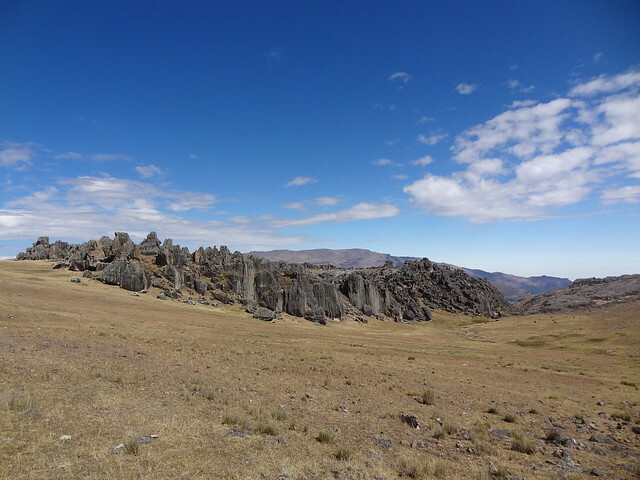 Once that was all sorted to Val’s satisfaction, the three of us headed across the grassy plateau and then up a steep incline, up, up, up, out of the Cuchilla Pampa and onto rockier terrain. A short break at a shallow pool provided the first photo opportunity. Later on, the shadow of a hummingbird (this high?). Magical mountain vistas continued as we climbed – slower going than usual for me, and not just because of the views. Val got Barney and me to try out our snow skills on the first patch of snow we got to, and a little later we arrived at the Cho Cho (Choco?) Pass (5100m) where Claus, Bertho, Freddie and Olly-the-dog caught up with us. Melky was taking the donkeys back out along the Quebrada Quilcayhuanca and meeting us at Ishinca Base Camp in a couple of days time. Absolutely amazing views of Ranrapalca (6162m) and the Ranrapalca-Ishinca col we’d be crossing on Saturday as we left the Quebrada Quilcayhuanca and moved into the Quebrada Cojup. Lots of photos. Helmets on as the rock hopping descent began. 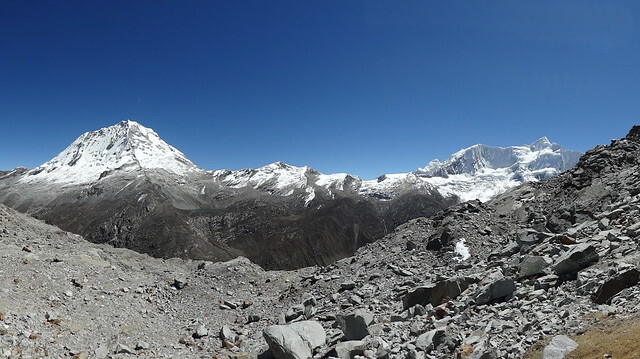 A long, steep and tiring descent to lunch at 4660m – I got a pounding headache and really slowed down. Val stayed with me, chatting, as Barney and the chaps powered ahead. A fox provided entertainment as we tucked into lunch, admiring the views down into the valley. More descent, over grass and dirt track to a pampa for a short break and and then more zig zagging down to the river, and camp 5. A gorgeous spot with a fabulous view up towards Laguna Palcacocha and the twin peaks of Nevados Pucaranra (6156m) and Palcaraju (6274m). I was too shattered to appreciate it, crashing out in the tent and sleeping until Val called me for dinner. Bonfire No 3. Early to bed. Cordillera Blanca Traverse day 6. My diary stopped on 9th July (and that entry was written on the bus back to Lima), so from here on in I’m reliant on my initial blogpost (Cordillera Blanca Traverse: Complete) supplemented by memories jogged by my photos. Our start up the northwestern slopes of Quebrada Cojup coincided with the sun reaching our part of the valley. A lot of up, a lot of bush bashing, rewarded with hidden lakes and stunning views of Pucaranra and Palcaraju massifs – but I still wasn’t on form, slow going and hardly any photos (now, that’s a sign that all is not well!). High camp was on the shores of a small lake, deserted but for a handful of nesting water birds. Beautiful but harsh – set in the rock field, with frozen waterfalls falling from Ishinca‘s snowfields into the north side of the lake. After lunch I went for a potter along the lakeside, practising with my Scarpas for tomorrow’s crossing of the col. Here and there, alpine flowers and strange, prehistoric-looking plants grew amidst the boulders. Wonderful light on the lake and mountains as the afternoon turned into evening. Cold once the sun had gone, so speedy dinner of veg spag bol, then bed. Cordillera Blanca Traverse day 7. 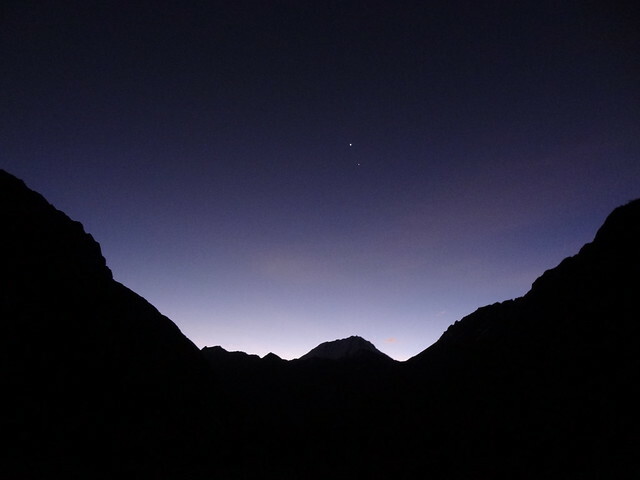 4am alarm for our crossing of the col and Nevado Ishinca summit attempt. Val made tea and porridge in the tent and by 5am we were off, crossing the rock fields by the light of our head torches. Beautiful dawn over the mountains behind us and we reached the snowline around 7.45am. This is where I had my first proper experience of soroche – spending 5 minutes trying to put on Barney’s crampons (size 11, blue straps) – I only realised that they weren’t mine when I started to do up the straps… definitely out of it. Still, I made it up to the Ishinca / Ranrapalca col, with blue skies and stunning views out over the Cordillera Blanca – incredibly photogenic. Patrick Runggaldier’s annotated panorama of from the summit of Ishinca has been very handy in helping me name what we saw. Freddie and Bertho (and Olly) continued on down from the pass leaving Val, Claus, Barney and me to set off across the snowfield towards Ishinca. Faced with the steeper slopes I decided today wasn’t the day for my first Nevado, and Val stayed with me leaving Barney and Claus to continued on to summit. After taking lots of photos of Barney and Claus on their ascent (and worrying, just a little, whenever they were out of sight), Val and I headed down across the snowfield to the path where Freddie and Bertho (and Olly) were waiting. Time for sandwiches and more photos. Lovely. Once Claus and Barney returned and photos and food were dealt with, we set off down the path into the Quebrada Ishinca. Even that was exhausting (I got another headache) and I was very happy to get to Ishinca Base Camp – even if the final stream crossing almost finished me off! Lots of tents at camp 7, a beautiful setting and a rather fine refugio – reminiscent of the ones on the Mont Blanc Circuit. Nice to see Melky and the dining tent again! I think we had beers bought from the local ladies to celebrate the Ishinca summit. Cordillera Blanca Traverse day 8. Everyone was happy with a rest day. After a late breakfast, Val, Barney, Bertho and I headed back up the Quebrada Ishinca to lovely Laguna Milluacocha with its cairns and Nevado Tocllaraju (6032m) backdrop. Lots of birds, including an Andean Flicker, plus a viscacha on the way back. Afternoon scrabble and coffee in Refugio Ishinca. Lots of people eating in. Cordillera Blanca Traverse day 9. An early start for our ascent of Urus. We followed a clear path from behind the refugio and up the northern flanks of the Quebrada Ishinca, watching the sun rise over the Cordillera Negra to the west and the three peaks of Ranrapalca, Ocshapalca and Janyaraju to the south. Barney wasn’t feeling too good, so he turned back with Claus and Freddie leaving me with Val and Bertho. Not 100% myself, but feeling more energetic and positive after a rest day. No problems with crampons today, and crossing the rock fields in Scarpas went OK. I cheated a bit – Bertho carried my heavier boots up to the rock/snow so I could wear my Salomons while we were on the path. I still found it hard going though and the rope regularly tightened as I sank to a slower pace than Val wanted. Amazing views from our stop at the col between Urus Este and Urus Oeste, and all the more jaw dropping from the top – which I *think* was Urus Oeste (Val’s circled it on the map and fits my memories of the col), which the map gives as 5350m. Clear views back to the Ranrapalca / Ishinca col and the adjacent peaks, plus Tocllaraju (6032m) and Palcaraju (6274m) and Laguna Milluacocha just peeking out. 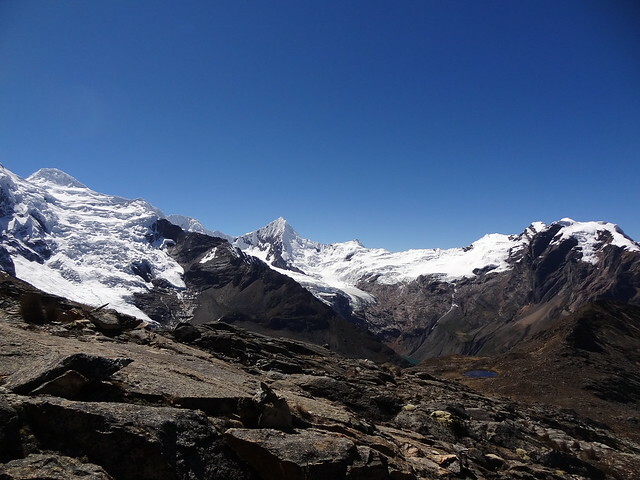 New views to our north and east, with Nevado Akilpo and its laguna coming into view to the east and Nevado Copa (6188m) not quite managing to hide Huascarán Sur (6768m) – the highest mountain in the Cordillera Blanca and the whole of Peru – to the north. Patrick Runggaldier’s annotated panorama of from the summit of Ishinca helping here again! Lots of photos, and then a speedy descent as the day was warming up and the snow getting softer. We didn’t meet a single soul all day – contrasting with the lines of climbers we’d seen descending yesterday. The descent was a real slog, particularly once we were back on the path. I slipped three times, every muscle in my neck and shoulders tensed, and the refugio stayed a resolutely tiny speck in the distance – there were times when I thought I’d never be back in the valley again, let alone our camp. Cordillera Blanca Traverse day 10. Another day of up-and-over, heading back up the northern slopes of Quebrada Ishinca to cross into the Quebrada Akilpo (Akillpo, Aquillpo) via the Akilpo Pass. Scarpas and crampons again, rope, harness and helmets for the final section over lose rocks. Tiring. Cloudier than yesterday, and colder too. Grey views back towards Ranrapalca, Ocshapalca and Janyaraju, and once we reached the pass we found cloud covering the peaks to the north, hiding Copa and Huascarán Sur. Akilpo was close and clear though, Tocllaraju too. Another long descent down into and out along the Quebrada Akilpo, returning to grassland. As we followed the stream, bushes and trees reappeared too. Camp 8 – our last night’s camping on the Traverse – came with a large boulder that served as a kitchen, a bridge across the stream and great views of Nevado Akilpo. Lovely evening light lit up the skies and the snow. We dined by the light of our final bonfire. Cordillera Blanca Traverse day 11. Frost on the tents at our Quebrada Akilpo camp, but beautiful clear views back to Nevados Akilpo and a lovely walk out from the Cordillera Blanca along the Quebrada Akilpo. Woods, water, flowers – and farms as we approached the roadhead and Inca ruins at Honco Pampa (Joncopampa on the map). It felt like we were suddenly in a different world. Birthday present given and received, then back to Huaraz and the Hotel Colomba for a shower and thank you / farewell / birthday beers, then a birthday dinner, complete with chocolate cake and sparkler, back at Bistro de los Andes. 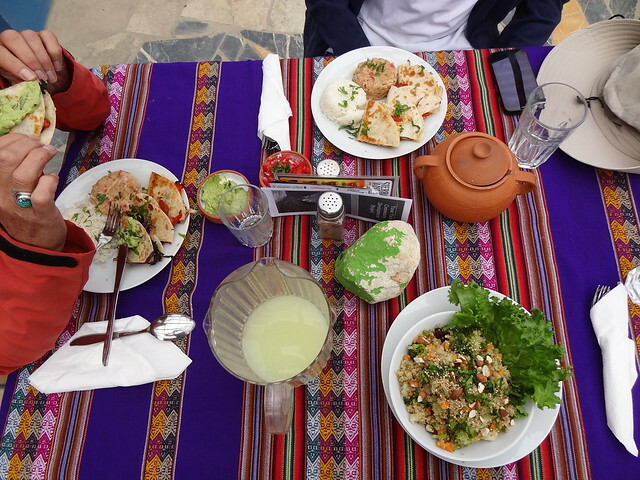 We left Huaraz and the Hotel Colomba to spend our last couple of days at Hatun Machay. The taxi there with Val and Melky took us back along the main road south. Dark clouds over the southern Blanca – Hatun Machay was looking a much better option than our alternate plan, Pastoruri. A large Dragoman-type group of climbers staying at the refugio included a bunch of Brits, some more annoying than others. Tents pitched in the grounds of the refugio, we lunched and then spent the afternoon exploring the Wari caves and rock climbing. Well, Barney, Val and Melky did – I took photos. Tea and biscuits, and later dinner, back at the refugio. 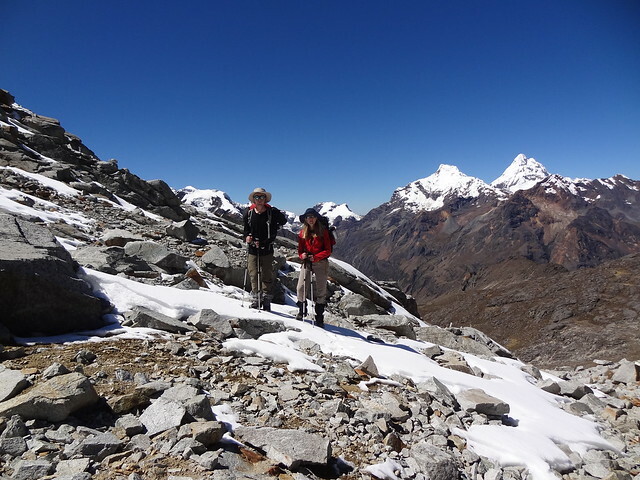 A morning stroll up the hill between the refugio and the road for fab views of the Cordillera Blanca and the Huayhuash. Cloud accumulating on the peaks as we watched. A couple of hours’ rock climbing, returning to the refugio just in time to beat the rain. A rainy taxi ride back to Huaraz and our last night at the Hotel Colomba. Pottering and packing at the hotel, then beers bought by Barney at the Café Andino followed by a final slap up meal in El Rinconcito Minero. Stage 1 of the journey back to reality on the Cruz del Sur. Final coffee Café Andino then farewells at the bus station. Usual slow crawl back into Lima, where Alphonso was waiting patiently to drive us to the Faraona Grand Hotel, although arriving too late for the complimentary Pisco Sour. Dinner à la supermercardo. Morning in Miraflores. Barney chilled out at the hotel, I walked down to the seafront and strolled along the prom. Once again my return stopover in Lima coincided with El Corso de Wong, so Alphonso recommended an early transfer to the airport for our overnight flight to Amsterdam with KLM. We whiled away the hours before check in watching the world / people go by and reading. Final hop back across the channel to London – me to Heathrow, Barney to City. With our rucksacks doing the reverse. Trip No. 3 to the Peruvian Andes with Val Pitkethly, and definitely the toughest so far: ten nights over 4000m, seven valleys, three passes over 5000m, and a peak: Urus / Yanarahu, at 5495m. A lot of up and down, two stretches with daypacks plus portered kit only, and several stints in harness and helmet, rope, crampons and ice axe. The trek / traverse was made harder by a flu-type bug/virus that we all picked up, which meant I had my first proper experience of altitude sickness – as we prepared to cross the first snow covered pass at ~5300m and I tried to put on Barney’s crampons (size 11, blue straps) and only realised that they weren’t mine when I started to do up the straps… Definitely out of it. Exhausted too, coming down from that pass, and it meant I didn’t do Ishinca, the first of our main peaks. Barney and Claus summited that on their own, but sadly sans camera. We finished off the trip with a couple of days rock climbing and exploring the Wari caves at Hatun Machay – very luckily avoiding the downpours that were by then covering the Blanca in snow and rain. We’d spent a couple of acclimatisation days at the Lazy Dog Inn before starting our trek and had hail there… so very lucky having good weather for the 11 days of our Cordillera Blanca Traverse. Monday 29 June 2015: London to Lima via Amsterdam, with KLM. Overnight at the Faraona Grand Hotel, Miraflores. Tuesday 30 June 2015: Cruz del Sur bus from Lima to Huaraz (3052m). Dinner at El Rinconcito Minero, with Brian & Mia, Jim & Donna – four Canadians who’d just completed the Alpamayo Circuit with Val. Overnight at the Hotel Colomba. 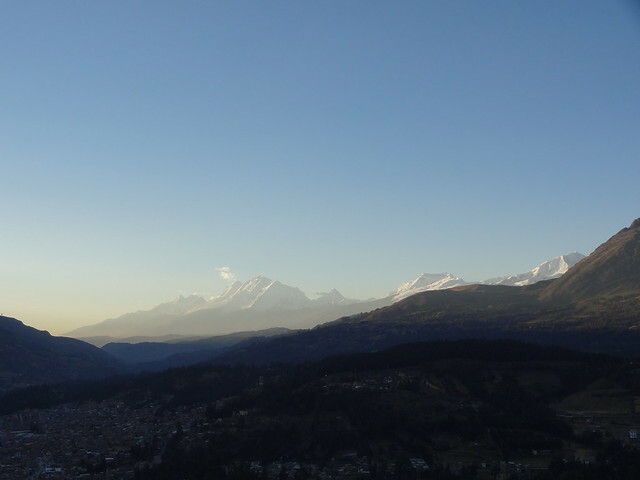 Wednesday 1 July 2015: Acclimatisation day 1, Huaraz (3052m): Out and about in town, with a taxi ride with Ebel up to the cross and Mirador at Rataquenua for sunset over the Blanca. Dinner at Bistro de los Andes, overnight at the Hotel Colomba. Thursday 2 July 2015: Acclimatisation day 2, Huaraz (3052m): Cordillera Negra descent, from Shecta back to Huaraz. Dinner at Creperie Patrick (with the complimentary Pisco Sour), overnight at the Hotel Colomba. Friday 3 July 2015: Acclimatisation day 3: Taxi to The Lazy Dog Inn (3650m) and hike up to the Parque Nacional Huascarán sign at 3965m. Lunch and knitted souvenirs at Cafe Yurac Yacu. Dinner and overnight at The Lazy Dog Inn – in the teepee! Saturday 4 July 2015: Acclimatisation day 4: Day hike up to Quebrada Achiqua ( Q. “Ahuac” on the map) and “just round the corner” (and up!!) to 4600m. Dinner and overnight at The Lazy Dog Inn, night 2 in the teepee. Hail and a headache. Sunday 5 July 2015: The Lazy Dog Inn (3650m) to Cruz Cayesh / Quilcayhuanca (4060m), by minibus to the entrance to the Parque Nacional Huascarán at Pitec, then on foot along the Quebrada Quilcayhuanca. Donkeys, Melky and Claus following, after lengthy negotiations over the increased village payment at the gate. Acclimatisation walk up the Inca lookout hill at the junction of Quebradas Cayesh and Quilcayhuanca. Monday 6 July 2015: Cruz Cayesh / Quilcayhuanca (4060m) to Cayesh Base Camp (4400m). Afternoon hike up the glacial moraine to see the peaks, the glacier and the mineral lakes – and to acclimatise and to practice walking up/across scree (still not my strong point, it turns out). Tuesday 7 July 2015: Cayesh Base Camp (4400m) to Pampa Tullpacocha (4270m): Morning hike up to the Punta Villon / Maparaju Glacier (5000m), afternoon stroll back down the Quebrada Cayesh and further up the Quebrada Quilcayhuanca to our camp at Pampa Tullpacocha. 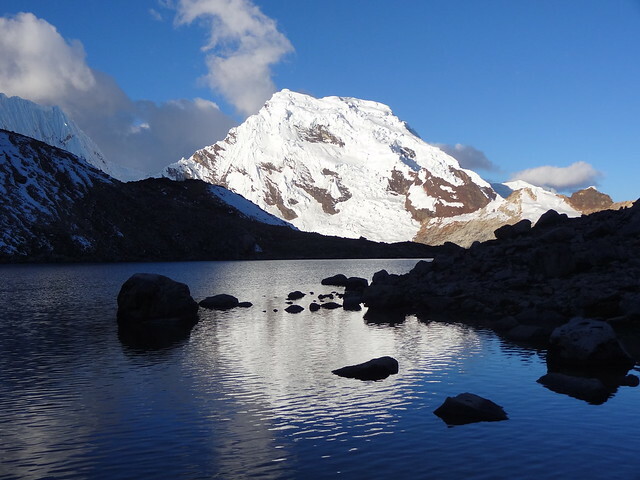 Wednesday 8 July 2015: Pampa Tullpacocha (4270m) to Cuchilla Pampa camp (4572m): Morning walk up to Laguna Tullpacocha (4395m) – glacial blue with Tullparahu backdrop, then zig zag up along an old Inca route to Cuchilla Pampa, and a stroll to Laguna Cuchillacocha (4695m) before a late lunch back at camp. Traverse prep and packing in the afternoon, and meeting Freddy and Beto, our porters. 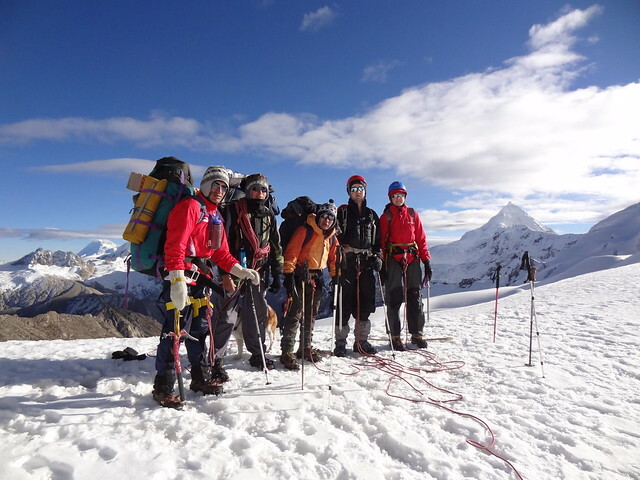 Friday 10 July 2015: Quebrada Cojup Camp (4387m) to Ishinca High Camp (5082m). A lot of up, a lot of bush bashing, rewarded with hidden lakes and stunning views of Pukaranra and Pallqarahu massifs – and “our” lake, deserted but for nesting water birds. Saturday 11 July 2015: Ishinca High Camp (5082m) over the Ishinca / Ranrapalca Col (5380m) and down to Ishinca Base Camp (4385m). Soroche for me, Nevado Ishinca summit (5530m) for Barney and Claus. 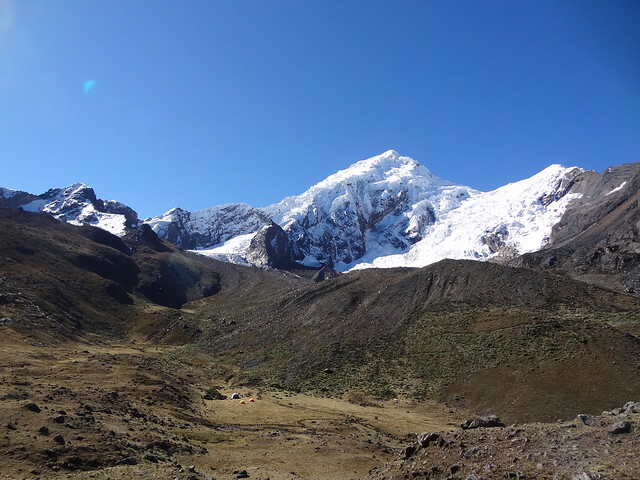 Sunday 12 July 2015: Ishinca Base Camp (4385m): Rest day with a walk to Laguna Milluacocha and its cairns, and Nevado Tocllaraju / Tuqllarahu (6032m) backdrop. Afternoon scrabble and coffee in Refugio Ishinca. 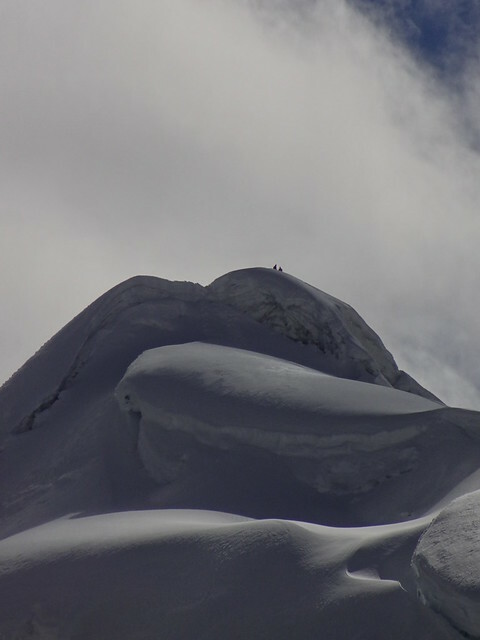 Monday 13 July 2015: Ishinca Base Camp (4385m): Nevado Urus Este summit (5423m). A slog, especially the descent. Tuesday 14 July 2015: Ishinca Base Camp (4385m) over the Aquillpo / Akilpo Pass (5062m) and down into the Quebrada Aquillpo (4220m) for our last night’s camping on the Traverse. Wednesday 15 July 2015: Quebrada Aquillpo (4220m) to the roadhead and Inca ruins at Honco Pampa (3515m). Back to Huaraz (3052m) for a shower, thank you / farewell / birthday beers and birthday dinner at Bistro de los Andes, complete with chocolate cake and sparkler. Overnight at Hotel Colomba. Thursday 16 July 2015: Huaraz (3052m) to Hatun Machay (4290m) by taxi with Val and Melky for an afternoon of Wari caves and rock climbing. Friday 17 July 2015: Hatun Machay (4290m) to Huaraz (3052m): a morning’s rock climbing, then a rainy ride back to Huaraz for beers bought by Barney at the Café Andino followed by a final slap up meal in El Rinconcito Minero and our last night at the Hotel Colomba. 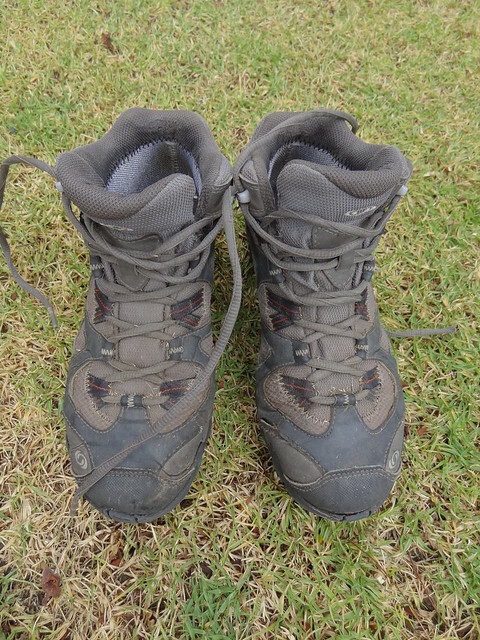 Saturday 18 July 2015: Huaraz (3052m) to Lima via Cruz del Sur. Overnight at the Faraona Grand Hotel, Miraflores. Sunday 19 July 2015: Morning in Miraflores – once again coinciding with El Corso de Wong, so an early transfer to the airport for our overnight flight to Amsterdam with KLM. Monday 20 July 2015: Final hop back across the channel to London – Heathrow and City respectively. With our rucksacks doing the reverse. In the meantime, I’m keeping an eye on the weather in Miraflores, Lima and Huaraz (via the excellent yr.no website)…. and Newgale as I’ve also got a weekend trip to Wales for Everest Trek Get Together No 7. Barney’s going to be joining me in Peru this summer for Val Pitkethly’s Cordillera Blanca Traverse – w00t w00t!! 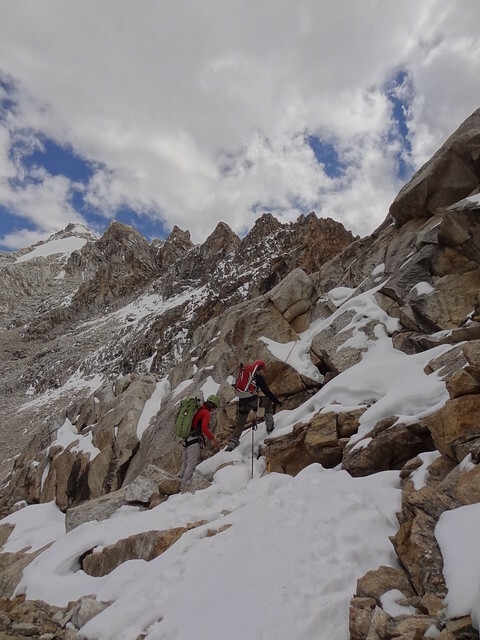 I also spotted that last summer Mark Horrell did a pretty similar route to our planned one – which he wrote up on his blog, Exploring the Cordillera Blanca’s high altitude playground. But pink??? (Calling it ‘dahlia’ doesn’t make the gender stereotyping design any more palatable.) 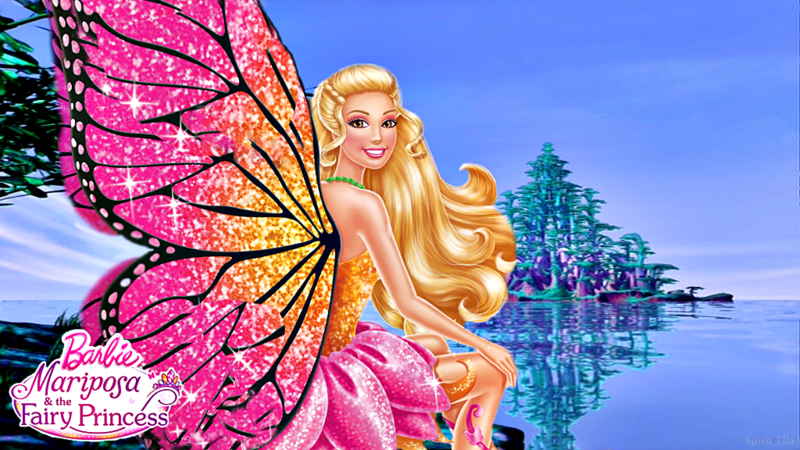 Am I supposed to dress up as a sugar plum fairy before I don crampons for the Cordillera Blanca Traverse? And ‘Rebel’ – really? How do you square that with the messaging sent by the pink and silver colours? Yes – just add matching boots and crampons! Actually, I’ve just spotted that the Men’s equivalent starts at size 41. That’s the size I bought, so I’m going to see if I can exchange my pair of Women’s Rebel Lite GTX ‘Princess Barbie Mariposa Gender Stereotyped‘ GTX boots for the petrol/orange version. If that’s not possible, it’ll be time to get the black permanent marker pen out…. Destination: Back to Peru with Val, to do the Cordillera Blanca Traverse. 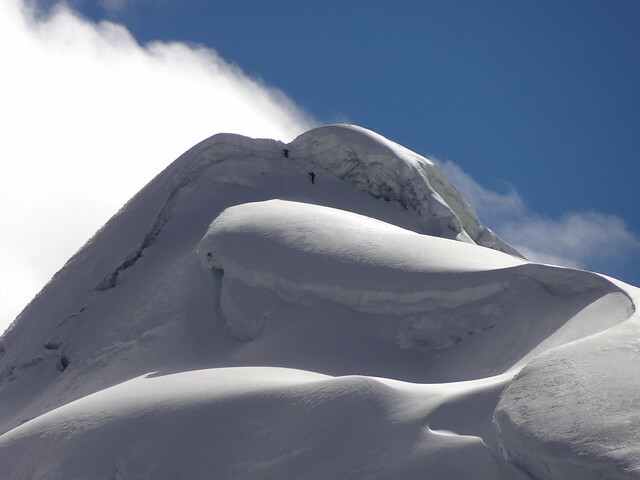 Why: To trek and climb in the high, snowy mountains of the Cordillera Blanca. 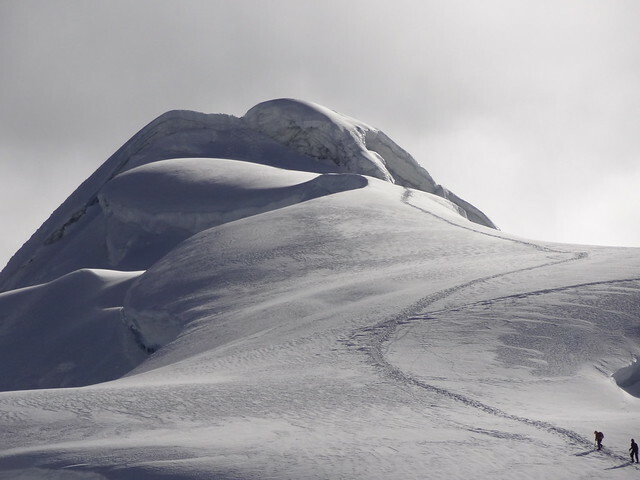 It’ll be non-technical winter climbing involving ropes, crampons and ice-axe, and “[Ishinka / Ishinca (5550m/18204ft) would be] a good one up from last year’s climb” Val tells me. I expect we’ll also be delivering / repairing some of LED‘s solar lights. How: On a private trek with Val Pitkethly. Flights booked with KLM today. What: What happens once I’m in Huaraz is up to Val! 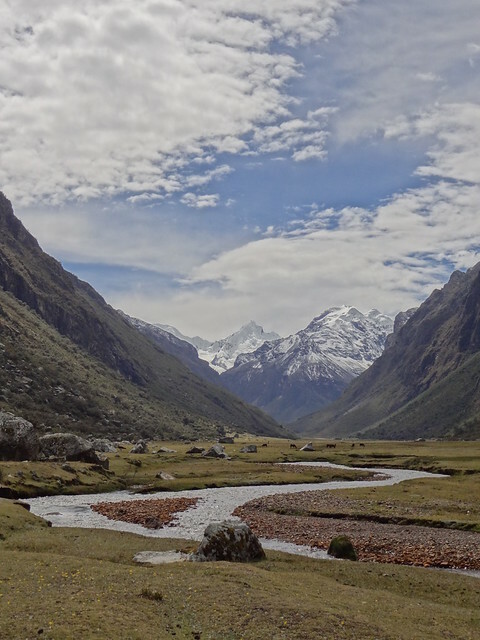 We’ll be in the the Parque Nacional Huascarán (Huascaran National Park, UNESCO World Heritage Site No 333) again, this time the section to the north of Huaraz. Into Quebrada Cayash and up to Culliacocha lakes (Laguna Cuchillacocha, 4650m) and over Cho Cho pass (Choko / Choco, 5030m). Up to Cojup (4250m) and over Ishinka / Ranrapalca col with optional climb of Ishinka / Ishinca (5550m/18204ft) then option of Urus (Urus Este, 5420m). Depending on conditions we might go over the Aquillpo pass (Akilpo pass, 4800m) before descending Quebrada Aquillpo and back to Huaraz. We might fit in a quick trip to the Southern Blanca again if there’s time. The Hiking Life Cordillera Blanca Traverse – Stage 1 – “It’s a long way……..”, Stage 2 – The Polish Ghost, Stage 3 – Pitec to Chavin & Stage 4 – The End?